The Interpolar War caused a dramatic decrease in the number of duelling events taking place across the planet. Most of the better Duellists found themselves drafted into the polar armies or on the run, and few viewers were interested in witnessing arena fights when their city-states were under attack. Once the war ended, however, the arena promoters made sure thing went rapidly back to normal. New duelling events are heavily romanticized, the action sequences are unbelievable and the fans are eating it up like never before! 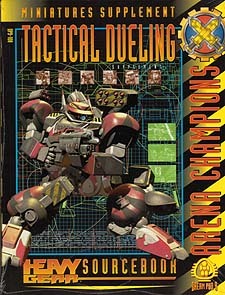 Tactical Duelling explores the various settings where modern Duellists and other fighters meet in battle. Along with some background information on the Duellists' traditions, the core of the sourcebook contains rules for playing arena battles with the tabletop wargaming rules introduced in the Tactical Miniatures Rules.